Quite a new addition to our fleet our pick and mix cart is available to hire for your event. It’s a bit different to other stalls out there on the market and we think it look great! This isn’t just any cart though, this is a designer cart from Jimmy Chew! (we couldn’t help ourselves). 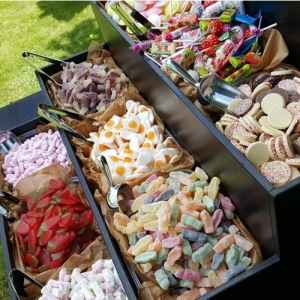 The cart come with a nearly 30 kilos of sweets for you guests to enjoy, we never scrimp or penny pinch at any of our events. As you can see from some of the pictures it really is fully loaded. We have several of these carts so whatever sized event you are planning we can help. We haven’t been asked yet but as with all our items we can brand them and change them to suit. You want it a different colour, we’ll sort it. You want it without the wheel? Let us know and we’ll sort it! We have accounts at all the major wholesalers and can pretty much get any sweet you can imagine. Schools special treat for leavers etc. Corporate Family Fun Days, Christmas parties – you will be number one employee if you book a cart with free sweets to eat! Weddings – kids and adult love dipping in and choosing sweets, reminiscing about the sweets they used to eat when they were kids. A sure-fire hit! Themed nights – we did a fantastic Christmas event this year, think Victorian Christmas or winter wonderland. So, if you need a sweets stall, candy buffet or pick and mix cart then look no further, pick up the phone and give us a call.